Don’t let the bird food topping fool you. 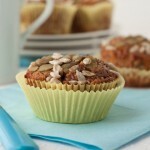 These muffins are so ridiculously tasty and don’t taste at all like they’re ‘good for you’. 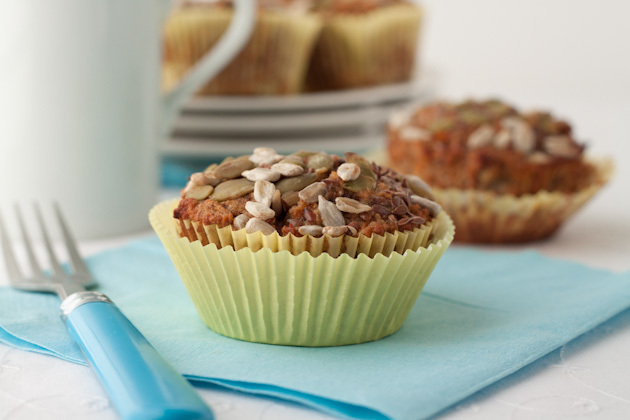 At just under 170 calories per muffin, you can feel good about indulging in one of these on your way out the door, packing in your child’s lunches, or just making a batch for yourself on a sunny Wednesday morning. Combine all wet ingredients in a medium sized bowl. Add dry to wet and stir until incorporated. Add in shredded carrots, banana, raisins, and dates. Stir until just mixed. Drop mixture into prepared muffin liners and top with the mixture of seeds. Bake for 15-20 minutes or until toothpick inserted comes out clean. Mine took exactly 17 minutes.